Pendant lights are a versatile and functional form of decorative lighting for any room of your home. Large light fixtures work well in expansive living areas or large kitchens. You can create a very decorative effect in a large room using several matching or complimentary pendant lights. If you have a relaxation or reading area in your living room or bedroom, a fixture that will direct the light to that specific area would be a good choice of lighting. The style of lamp shade affects the brightness and the direction of the illumination. A light such as the energy efficient Olympia Olde Bronze Mini Pendant would be a beautiful addition to a bathroom. It would also work well in a small area of a bedroom or as a subtle form of lighting in a nursery. For greater light in a bathroom area, you might want to select a style of light that extends across the sink and vanity area. There are pendant light sets that allow you to create a functional, decorative bathroom lighting design. Pendant lights, sometimes called pendant lamps, are perfect in a home with modern decor. A metal light with a cone shaped globe is just one example of a modern design. A red, white, and black glass pendant light would be a perfect accessory to a modern decor. An awesome spiral glass pendant would certainly enhance a modern style room. Lights with contemporary and tradition styling features are easy to locate. You have a choice of colored shades, metal shades, decorative shades, or simple designs of glass shades. For kitchen areas there are lights that extend across a decorative bar to provide sufficient lighting for an island or bar area. 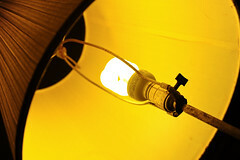 There are variations in the type of bulbs the lamps require. Some lights actually have a "pull up or down" feature. Your selection basically depends on your decorating style and on the amount of light you need for a specific area.